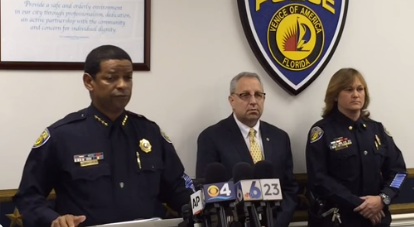 Fort Lauderdale Police Chief addresses the press on Tuesday regarding a police officer who was caught on camera slapping and pushing a homeless man. The U.S. Justice Department this week announced it will not charge George Zimmerman with civil rights violations in the case of the killing of Trayvon Martin. Martin's death preceded several recent killings of young, unarmed black men that have sent protesters to the streets, renewing the conversation about police relations with minority communities. Host Tom Hudson discusses some recent incidents involving South Florida cops. A Broward police officer is in the spotlight this week for slapping a homeless man. Protesters at Miami Gardens City Hall this week called for justice in the police-involved shooting of a mentally ill man. Also, who to watch this year at Florida's Legislative Session? And President Obama visits Miami to hold a town hall on immigration. Tom Hudson is joined by the Sun Sentinel's Doug Lyons, Miami Herald's Julie K. Brown, Caroyln Guniss of the Miami Times, WLRN's Gina Jordan, Steve Bousquet of the Tampa Bay Times and The Takeaway's Todd Zwillich. On the Florida Roundup we discuss the week's news with the area's top journalists. Pres. Obama's immigration reform plans were blocked after a federal judge put an order to halt the process. This hold has affected families in South Florida. Despite the president's diplomatic-restoration plans with Cuba moving through three days of Congressional hearings on Capitol Hill, discussions continue among South Floridians about parts of the policy. Whether changes to policy will influence change on the communist island is still up in the air.